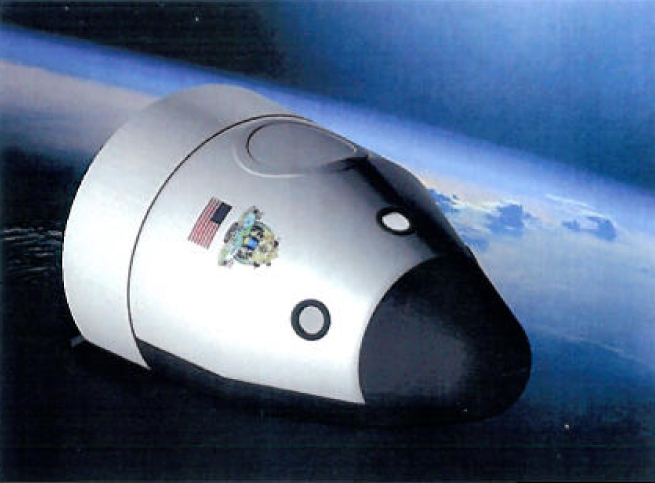 Rendition of Blue Origin’s biconic orbital crew spacecraft (Credits:Blue Origin/NASA). NASA’s Commercial Crew Program (CCP) partner Blue Origin has successfully fired the thrust chamber assembly for its new 100,000 pound thrust BE-3 liquid oxygen, liquid hydrogen rocket engine. As part of Blue’s Reusable Booster System (RBS), the engines are designed eventually to launch the biconic-shaped Space Vehicle the company is developing. The test was part of Blue Origin’s work supporting its funded Space Act Agreement with NASA during Commercial Crew Development Round 2 (CCDev2). CCDev2 continues to bring spacecraft and launch vehicle designs forward to develop a U.S. commercial crew space transportation capability that ultimately could become available for the government and other customers. The test took place early this month on the E-1 test stand at NASA’s Stennis Space Center near Bay St. Louis, Miss. Blue Origin engineers successfully completed the test by powering the thrust chamber to its full power level. As part of CCDev2, Blue Origin also completed a system requirements review of its spacecraft. During the review, engineers and technical experts representing NASA, the Federal Aviation Administration and the company assessed the spacecraft’s ability to meet safety and mission requirements to low-Earth orbit. That review also included results from more than 100 wind tunnel tests of the vehicle’s aerodynamic design, stability during flight and cross-range maneuverability. All of NASA’s industry partners, including Blue Origin, continue to meet their established milestones in developing commercial crew transportation capabilities. While NASA works with U.S. industry partners to develop commercial spaceflight capabilities, the agency also is developing the Orion spacecraft and the Space Launch System (SLS), a crew capsule and heavy-lift rocket to provide an entirely new capability for human exploration. Designed to be flexible for launching spacecraft for crew and cargo missions, SLS and Orion will expand human presence beyond low-Earth orbit and enable new missions of exploration into the solar system. TagsBlue OriginCCDevcommercialCommercial Crewexplorationhydrogenlaunch vehicleliquid hydrogenNASAOrionpowerreviewrocket testspacecrafttestingthrustU.S.